Here's the entire FAQ in one thread. If you're having issues or if you have any questions regarding things like signatures, your threads and all that, you should find the guide's here. We'll keep updating this as the time goes by. If you're having trouble finding what you're looking for, [CTRL+F] for Windows [CMD+F] for Mac helps to find the keywords for your concerns. How long to get my WSO Approved? Why is my signature now showing? Signatures are disabled in the WSO section. 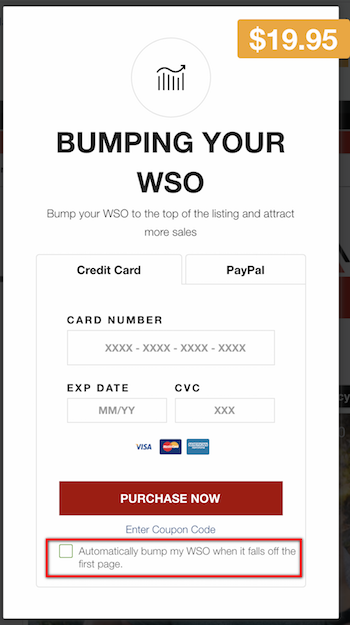 It is the reason why you may not see your signature file on paid sections, like the WSO section. This restriction has been posted to solely give the "advertising spotlight" to the user who paid for the WSO thread. First, you need to subscribe for the Signature. Refer to your User CP link below. Toggle the Signature, and once payment of $5 has been completed (lifetime fee), you can edit it here.in your profile section. When you visit this link you should find all your active subscriptions. You will know if you have successfully cancelled your subscription if the buy button is greyed out. Your War Room subscription will remain active until it expires. The cancellation will prevent the renewal of your subscription. If you've done this and you're still charged afterwards or your subscription still renewed, please contact us through our HelpDesk. All threads submitted are now subject to approval, and will be reviewed by the moderators before it gets posted. This is one of our major steps to eliminate the blatant spammers, and to filter valid threads. Make sure to review our guidelines before submitting. 3. 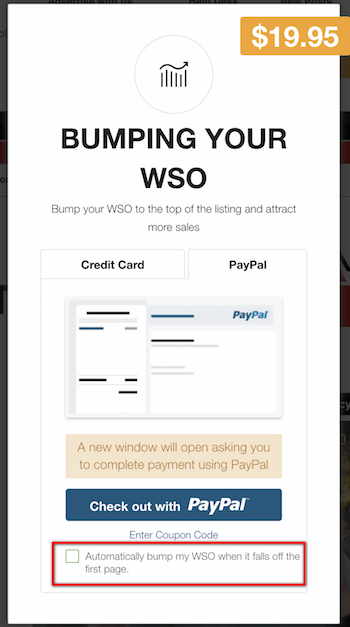 If you're satisfied with your WSO, just click Launch your Offer. You will be sent a payment link through PM wherein you would need to pay the listing fee of $20 to complete the process. 4. All threads are subject for moderation. Paying for a thread does not simply mean that your thread will go live automatically. It will still need to be approved by a moderator. For more information on how long threads are approved, check out the article below. Warrior Forum FAQ - How do I Change my Password? Just fill in the fields and click save changes and it should be good to go. If you somehow forgot your password in its entirety (or your username) and can't log in, you can reset it through this link. Doing so will prompt this window up. 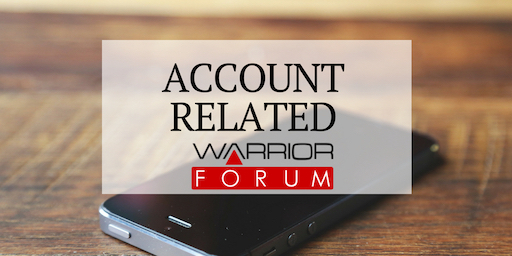 Just key in the email address you used to register your Warrior Forum account and it'll send a link wherein to you can reset your password. Note: Check your Spam or Junk folders in case you didn't receive the email. Whenever a sale is made, refunded or reversed, Warrior Payments will send a FORM POST message to the IPN notification URL specified for your product. The message will contain the EXACT response we receive from the PayPal GetTransactionDetails API call. 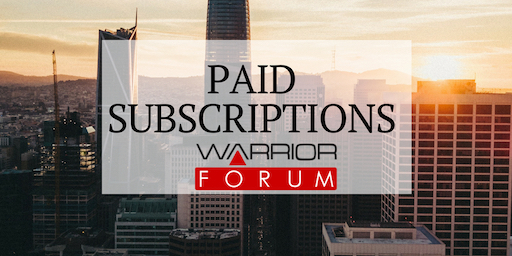 We will also send over extra Warrior Payments product related fields in the IPN message. The following table lists the extra fields sent in the current version (0.1). A WSO_SIGNATURE field is added to the POST data if an IPN Secret is specified. By recalculating the signature in your IPN processing script you can verify that the IPN notification was sent from Warrior Payments untampered. See the following code samples for the actual algorithm that can be used to verify the signature. This repository contains libraries for different web programming languages for handling WSO IPN (Instant Payment Notification) service. This contains the class WsoIpn that accepts the http request's parameter names mapped to its value and/or the secret key and instantiates the WsoIpn. The class includes methods for signature validation and simple field getters. This folder also includes unit tests for all the classes used in WsoIpn class. An example on how to instantiate and use the WsoIpn class is shown in the servlet IPNListenerServlet. The WsoIpn class can be extended to include functionalities (i.e., logging, persistence, etc.) necessary for other programs. Note: The WsoIpn class was written to include very little to no dependency to third party libraries. This contains the class WsoIpn that accepts the http request's dictionary of parameter and values. The class includes methods for signature validation and getter of necessary IPN data. This also contains unit tests for signature validation and an example of a Listener that uses Flask. This also contains unit tests for signature validation and an example of a Listener. The classes can be extended to include methods necessary for a program. The provided code only serves as a guideline and example as to how to handle a WSO IPN. The way any of the code was structured should not be treated as standards. The author is not liable for any errors caused by any WSO IPN library and shall not be responsible for any financial loss. Most of the time, after you're done setting up your signatures and avatars you find yourself not seeing them, or that you see images in posts showed as links instead. This would mean you didn't set your post elements to be visible. 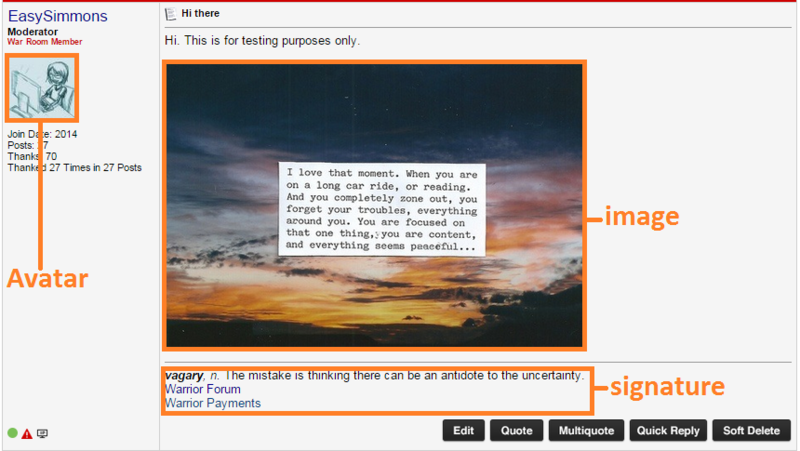 Post elements consist of these three: Signatures, images and avatars. 3. In the drop down menu, click "Edit Options"
4. Scroll all the way down and find, "Thread Display Options" under that you will see the "Visible Post Elements" and three check boxes. 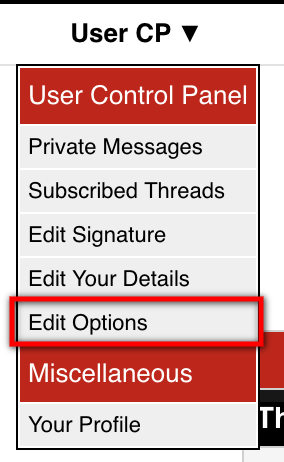 Click on those boxes to show signatures, avatars and images in posts and uncheck those boxes if you want to hide these options when you view the forum. Just disable the "Receive Email from Administrators"
This thread will serve as a reference for basic How To's in the Forum. Q: Why are my threads not showing? A: All threads submitted are now subject to approval, and will be reviewed by the moderators before it gets posted. This is one of our major steps to eliminate the blatant spammers, and to filter valid threads. Q: I submitted a WSO and even paid for it, why is it not showing on the Marketplace? Q: Why is my signature now showing? A: Signatures are disabled in the WSO section. It is the reason why you may not see your signature file on paid sections, like the WSO section. This restriction has been posted to solely give the "advertising spotlight" to the user who paid for the WSO thread. A: First, you need to subscribe for the Signature. Refer to your User CP link below. Toggle the Signature, and once payment of $5 has been completed (lifetime fee), you can edit it here. This is your primary product that customers must purchase before they enter your sales funnel. By default this is visible within the Warrior Payments Marketplace. This is a product that is offered after a customer has purchased a product. Upsells are not visible in the marketplace and cannot be purchased by customers as standalone products. If your customer presses "No thanks" after they are offered an upsell, you can then offer the customer a downsell. This can be variation of the original upsell product or an entirely new product in your sales funnel. Downsells are not visible in the marketplace and cannot be purchased by customers as standalone products. For each product in your sales funnel, you can choose to offer an Affiliate Commission or not. You can also select an Affiliate Commision Rate based on the offer being presented. For example, your first upsell could offer 75% Affiliate Commission, your second upsell could offer 50% Affiliate Commission, and so forth. Both the Upsell & Downsell Affiliate Commission Rates are fully customizable and can be configured to your requirements easily. Please note that like Front End Products, Affiliate Commissions must be between 1% and 100%. Like Front End Products, products inside your Sales Funnel must be between $1 & $10,000 USD. Please note that your profit will be the product price less Warrior Payments fees and any affiliate commissions if applicable. You can offer a unique dimesale or timesale for any product within your sales funnel. Each dimesale or timesale functions independently of any other offer in your funnel. Your first offer in the Sales Funnel must be an Upsell. 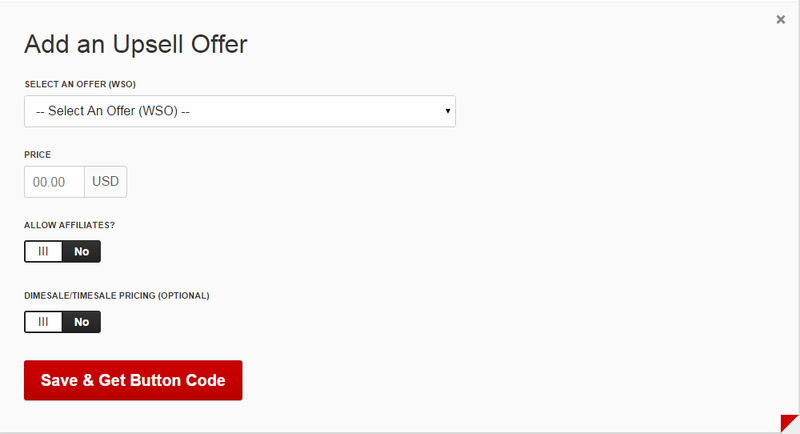 You can edit and configure any offer in your funnel by clicking the offer in the Sales Funnel. Clicking on your Front End Offer at the top of the Sales Funnel page will open a new window where you can edit your Front End Offer. Creating and editing your Warrior Payments Sales Funnel is managed using one page. At any time, you may edit this funnel and view performance metrics of each individual offer from within My Offers. 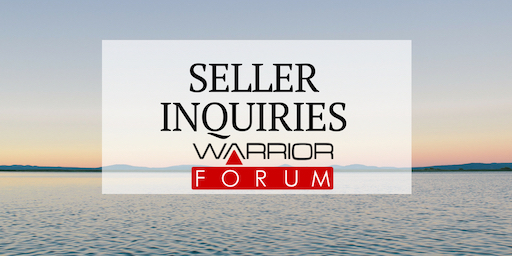 Once you have registered as a Warrior Forum member, navigate to Create A Sales Funnel by clicking Create Funnel in the main menu. On this page, select your Front End Product. You will then be taken to a page where you can create your Sales Funnel. Navigate to My Offers from the main menu. Find the product that you will be using as your Front End Product. 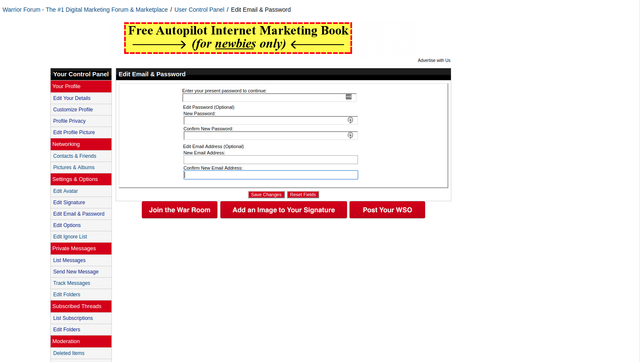 Click "Create Funnel" to create a sales funnel for this product. Select your Front End Product on the Create A Sales Funnel page. Your Front End Product is your primary product. This is the product that users must first purchase before they will be offered any upsells or downsells to the product. 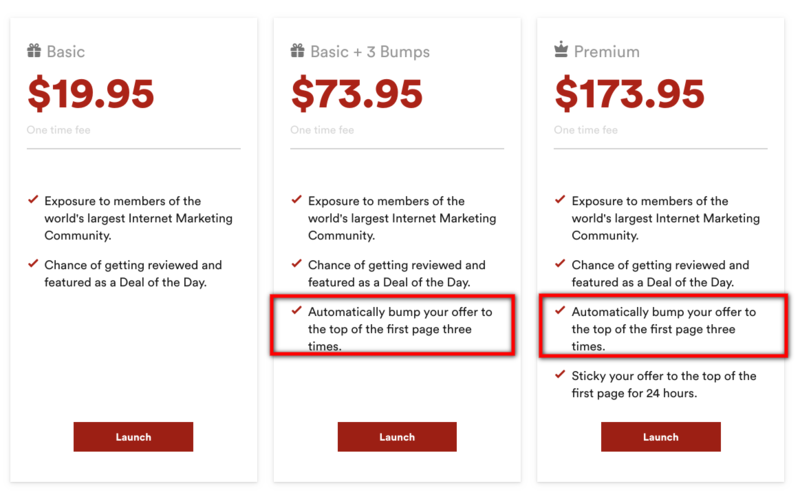 If you have already created your product and it appears in My Offers, you will be able to select this offer from the drop down menu on the Create A Sales Funnel page. 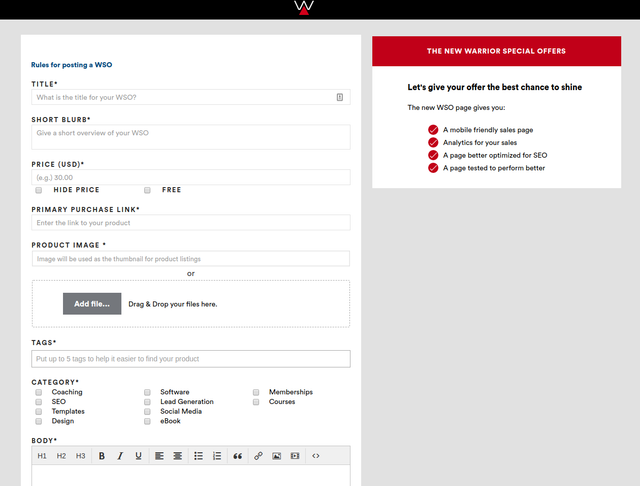 Alternatively, if you need to create a new product, select Create A New Offer (WSO) from the drop down menu. After you have selected your Front End Product from the drop down list, you will be taken to the main Sales Funnel page where you will be able to create and edit your Sales Funnel. Using this pane, you can select the offer, price, Affiliate Commission and add a Dimesale or Timesale to this offer. Downsells are offers that are presented to customers when they click "No thanks" to the previous offer. Like upsells, when you have created a Downsell, a pane will appear below the sales funnel, which will allow you to configure the downsell. Click on the cross in the top right of the offer. Hover over the offer and press Delete. Please note that you cannot will not be able to delete an offer if there are other offers (upsells or downsells) that stem from the product. After you have configured your product, click "Save & Get Payment Button". This will generate the HTML code so that you can embed the button onto your Sales Page. Please note: While your Front End Product can be hosted as a Warrior Special Offer, your Sales Funnel Offers must be hosted externally. To copy the HTML code, click Copy HTML Code. This will copy the code so you can then easily paste this into your Sales Page. Once your Payment Button has been published on your Sales Page, click Verify URL. The Warrior Payments Button must be live on your website to be successfully verified. After you have successfully verified your Sales Page URL, you are able to save this offer to your Sales Funnel. After you have created your sales funnel and are ready to publish your sales funnel, you can do so by clicking Launch Funnel. We recommend reviewing and testing each step in your sales funnel prior to launching your sales funnel. This concludes our guide to creating your Warrior Payments Sales Funnel. If you are experiencing issues creating your Sales Funnel or to submit user feedback, please contact us by clicking here. We are here to help you get the most out of Warrior Payments. how long will it take to get my WSO Approved. We offers several ways to promote and advertise your product or service on our forum. Please make sure to read, understand and follow our Marketplace Rules located here. You can advertise your product in our popular Warrior Special Offer section. If you want to advertise a website related product and/or service you can also post in this section. The Warriors for Hire section works best for service related offers like SEO, Design, Content Writing etc. Adverts for Products can not be posted to this forum. In case you want to promote a product you can post a Classified Ad or WSO. The Web Hosting Offers sections is for Hosting related offers. This is the right section if you want to promote your Web Hosting Company. For maximum exposure you can also run a Top Banner Ad on our site. The price for Banner Ads depends on the number of Impressions you want to avail. You can read more about our Banner Advertising options and guidelines by clicking here. You are also able to sticky threads to the top of the WSO sections. This will keep your Thread at the top of the section for 12 hours, inline with the rest of the other offers. 2. Make payment. Your Thread will be a sticky on the top of that section for 1 day. At the top of each forum section you will find Announcements Threads with further details on how to post and pay for a thread. Please also make sure to read the listing guidelines and marketplace rules. This is especially important when you want to run a WSO as there are specific requirements for posting a WSO. NOTICE: The Affiliate Program Database and Web Hosting sections are CLOSED. You may post 1 honest review for any WSO that you have purchased. Reviews should be factual and not misleading in any way. 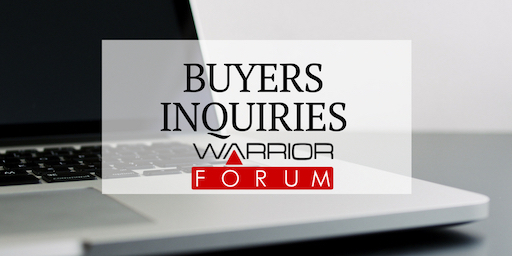 If the product you purchased was sold via Warrior Payments, you can honestly review the product from within both Warrior Payments and also on the seller's thread. - If you are an affiliate, or received a review copy of a product, you must state this when posting a review of the product. - Do not debate the sales process. If you believe something is deceptive, then report this to the moderators. you've purchased the initial offer. Do not argue about them, or make statements beyond the list of what is offered. The seller decides his or her own sales process. You decide if you wish to buy what's offered. - Multiple reviews within a sales thread are not tolerated. - Reviews must be of the product, not the seller nor the seller's previous products. - Personal attacks, name calling, and unproven accusations are not tolerated. While buyers are encouraged to review products and services, buyers must follow these guidelines. While many WSO's are digital products and services, buyers are not automatically entitled to a refund if they are unhappy with the product or service. If the seller offers a refund period as part of their offer, this will appear on the sales page or in the FAQ of their offer. If there are no mentions of a Refund Policy, buyers should assume all sales are final and no refunds are offered. If you wish to request a refund from the seller, you should contact the seller privately - either through a private message or via the seller's external support channel. Requests for refunds should only be made on the seller's thread if you do not receive a response from the seller within 2 business days. Keep in mind, sellers may be in a different time zone to you. If a seller fails to honor a posted refund policy, please report the offer to the moderators. 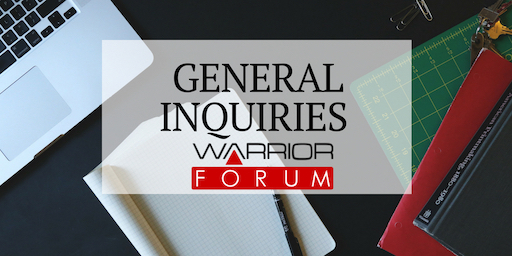 Products sold on the WSO marketplace are not sold by the Warrior forum but are rather just hosted by the Warrior forum on behalf of the product creators. We allow sellers to set their own policies and processes for refunds. We advise buyers to check the refund policies of products before buying whether by reading the sales copy or by contacting and clarifying with the seller beforehand. Requests for refunds should only be made on the seller's thread if you do not receive a response from the seller within 2 business days. Keep in mind, sellers may be in a different time zone to you. Imagine this analogy, let's say you bought some dodgy fruit in a farmer's market at a park. In this case, you would demand refunds from the farmer who sold you the fruit, not the park administrators. As with this case, you would get the refunds from the seller of the product, not with Warrior forum. If the seller fails to deliver the product or service as advertised, or does not honor a posted refund policy, please report the problem using the Report tool or contact the Helpdesk. In your report, include enough details to allow them to look into the claim properly, including the thread Url and the seller's username. To report a problem, use the red triangle to the lower left of the post you're reporting. Fill in the necessary information and submit the form. Please keep in mind that investigating a claim requires time and multiple reports should not be submitted. The forum is not part of the transaction between a buyer and seller. We have no ability to force a refund or any other action by a third party. We are limited to reducing or removing access by parties we believe may be acting improperly or who violate the forum or WSO rules as described here. Buyers should attempt to resolve any issues with sellers privately so the seller has the opportunity to fix any issues. Should the issue remain unresolved, buyers may report the problem or offer for moderators to investigate. Buyers should be aware that if you have purchased an offer, you may also review the product or service in the seller's thread. Admins or other people cannot subscribe you unknowingly to the autobump feature. Did you read the forum rules before writing your post? Most often, accounts are banned if they are considered spam. Advertising in the discussion forum is the most common reason why accounts are banned almost instantly. However, sometimes you get a timeout. If you're rude or disorderly our mods might put you on a timeout. The sanctions vary according to your violation. if you're banned for 3 days or so, don't message the help desk asking for the ban to be lifted. Just wait until the ban duration is over and you can come back. Do you want to clarify why you're banned or why you're permanently banned? Contact us through our Help Desk. When you create your account and you find that you cannot post anything in the forum, you might have forgotten to verify your account. Upon creation of your account you should have received an email to verify your account. If you don't do this, you won't be able to post. If you checked your email and you cannot find it, be sure to check your Spam Inbox as well. Adding Images to your Signature - $60 per year. You will be able to add a graphic to your signature. Warrior Book Club - $40 lifetime access. Where we discuss the best strategies for "Kindle Publishing and Promotion" success. It's also where we help, support and join forces with other Warriors interested in winning the Kindle publishing game. For the War Room membership, please proceed to this post. All our subscriptions come with small print. If you're a new user and you opt for the Free Trial for the War Room, it clearly states that if you fail to cancel the subscription before your free trial period runs out, you will be charged a monthly rate of $7.99 for your War Room Subscription. We do this because we already presented our Marketplace Rules and you should have read it prior to submitting. - Screenshot of the message you received that your offer has been rejected. Warrior Forum does not close/delete/deactivate accounts. We are unable delete the account in its entirety due to our responsibilities as a company. As a responsible company we hold onto details for financial, statistical and historical purposes. There are also rare circumstances where law enforcement requires us to cooperate with them which we are unable to do if we have deleted records.